Life expectancy in the United States is now 78.3 years of age and is increasing every year. Therefore, it is now more important than ever for senior citizens to take care of their teeth and gums. The link between oral health and overall body health is a two-way street. Chronic health problems often strike the elderly and can lead to poor oral health. Likewise, dental problems can cause or exacerbate certain health conditions, so it is imperative that mature adults proactively seek both medical and geriatric dental treatments. You can learn more about geriatric dental treaments on Wikipidia. The following are common dental problems that geriatric patients are prone to develop. Xerostomia. Also known as dry mouth, xerostomia is caused by a lack of saliva production. Older adults often develop this condition because of the medications they take. Saliva neutralizes oral bacteria and helps prevent cavities and gum disease. If you have xerostomia, consult with your physician to see if any of your medications may be the cause. Tooth decay. Tooth decay in geriatric patients often occurs because of many years of neglect. You may put dental checkups at the end of your to-do list if you are dealing with other chronic health conditions and only seek help when you start to experience pain, which can cause multiple problems down the line. Periodontal disease. Improper flossing, xerostomia, and certain health conditions can cause gum disease or make it worse. Gum disease has been linked to heart disease, diabetes, Alzheimer’s disease, and osteoporosis. To minimize your risk of developing these diseases, it is important to prevent gum disease by flossing daily and visiting Dr. Denes for regular checkups. Missing teeth. Untreated tooth decay and gum disease will eventually lead to tooth loss. Missing teeth are not only unattractive, they can also interfere with your ability to bite, chew, and speak. These gaps will need to be filled with dental implants or partial dentures to improve your quality of life. Cracked teeth. Many mature patients suffer from cracked teeth. Stress or certain medications can cause you to grind your teeth at night, and eventually the pressure can cause tooth breakage. Also, older patients often have silver fillings that were placed decades ago. Over time, these types of fillings can cause teeth to crack. Ill-fitting dentures. Because dentures do not stimulate the jawbone the way natural teeth do, the bone deteriorates over time and changes the shape of the face and mouth. 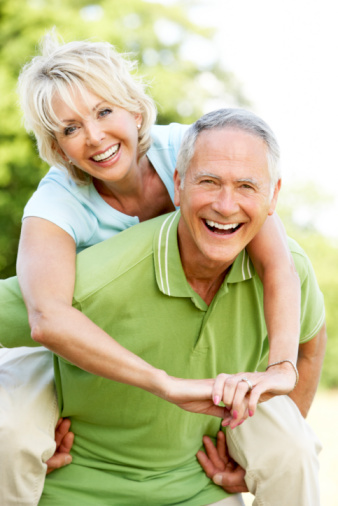 As a result, dentures need to be refitted frequently. Dental implants are a great alternative to dentures because they stimulate the jaw bone and help prevent bone loss. Oral cancer. Your risk of all types of cancer increases with age, and oral cancer is no exception. At each of your checkups, Dr. Denes will screen you for oral cancer. If you’re a mature adult suffering from one of these dental problems, call Drs. Alex Denes and Claudia Denes today at (559) 297-1800 for a consultation. Fresno Dental Studio serves patients in Fresno, Clovis, Sanger, Mendota, Orange Cove, Reedley, Selma, and the surrounding areas.